Central to Earl and Kimport’s argument is the role the Internet plays in the normalization of protest tactics; while the Internet is not responsible for the widespread acceptance of protest tactics and schemas, it has made the act of protest much easier to accomplish, allowing activists and fans to spread messages quickly, cheaply and widely. Furthermore, the Internet has also automated the act of protesting to an extent, thanks to websites and mobile apps that not only teach people how to protest, but allow users to spread petitions via email and social media sites. Research yielded results that bore out Earl and Kimport’s hypotheses, providing evidence that protest tactics and schemas have not only been normalized, but have been appropriated by fans who employ them in campaigns to save television shows in danger of being cancelled or to express interest in a sequel to a low grossing film (Fig. 1). While there are accusations that the Internet is responsible for an increase in what had been termed slacktivism, it is obvious that social networking sites have nonetheless made it easier to disseminate information about causes of all sorts. Fig. 1: Fans will sometimes engage in activist campaigns to save cultish TV shows that are in danger of cancellation, such as Jericho (right) and Roswell (left). As Melissa M. Brough and Sangita Shresthova (2012) point out, however, fans also use their fan identities to address real world issues, and protestors sometimes appropriate fan imagery to call attention to their causes. They point to the Harry Potter Alliance as an example of the way that fans can use their connection to a popular text to encourage others to engage in civil actions, and address issues of social justice, such as campaigning for Net Neutrality or raising funds for the victims of the devastating earthquake in Haiti (Ludwig & Slack, 2012). This is similar to the 501st Legion, a group of cosplayers that employ imagery from Star Wars to stage events and raise money for various charities. Both of these examples serve to illustrate that fans will often use their fan identities to engage in traditional forms of political protest. It is not only science fiction and fantasy fans that employ protest tactics and schemas to address issues that are important to them, however, and it is becoming increasingly common for fans of all types to make use of activism and protest tactics in various ways. For instance, Allison Jones (2010) discusses the campaign to save BBC 6 Music, a digital only radio station that was in danger of being shut down due to budget cuts. Fans of the station rallied to save it, creating a Facebook group that eventually attracted upwards of 90,000 members, and storming Twitter with hash tags like #savebbc6music and #save6music. They also engaged in physical protest tactics, with roughly 2000 people gathering outside the BBC Broadcasting House in Central London. While the protestors were fans of the station, they were also addressing a real world concern, with many claiming that if BBC 6 Music were to be shut down, it would strip listeners of any sort of real choice and encourage a homogenization of both music and culture. Brough and Shresthova also look at the ways that non-fan activists are appropriating fan imagery to address specific political goals. As one example, they point to what Henry Jenkins (2010) refers to as Avatar activism. In this instance, Palestinian rights groups staged a protest against Israeli military occupation by appropriating imagery from James Cameron’s 2009 blockbuster, which tells the story of an indigenous population that is oppressed and brutalized by an occupying force (Fig. 2). While the protestors may or may not be fans of the film, they nevertheless understand that its narrative parallels their own situation, and that by associating their cause with the iconography of a film that has been viewed by a substantially large worldwide audience, they are more likely to gain attention and perhaps sympathy from the mainstream media. So not only are fans appropriating protest tactics to address both political and non-political issues, but fan imagery is also being appropriated by non-fans who use it to engage in real world protest and activism. This suggests that the diffusion of protest tactics and fan imagery flows in both directions, and that they move back and forth across the boundaries of movement societies and inform one another. Fig. 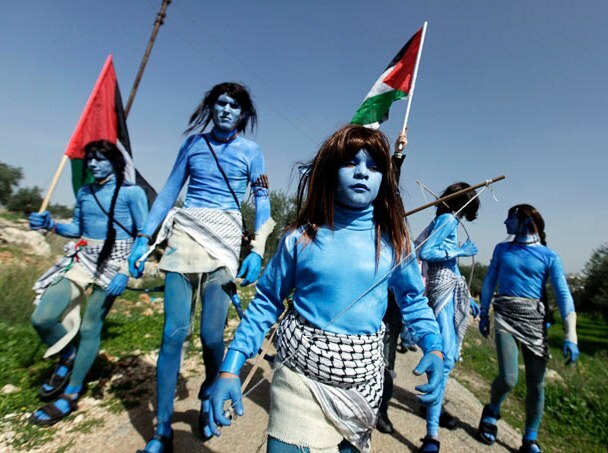 2: Palestinian, Israeli and international activists appropriate imagery from James Cameron’s blockbuster film Avatar to draw attention to their cause. This can be seen when looking at the ways in which fannish iconography was appropriated by activists involved in the 2011 protests of Wisconsin Governor Scott Walker. Combining fan imagery with traditional protest tactics and schemas, activists were able to not only gain attention for their cause, but were also able to alter and reinforce the very meaning of the protest. This is made evident by a popular image that emerged from the protest, in which activists held up a sign that said “STOP THE IMPERIAL WALKER” in reference to Governor Walker, but featured an image of an AT-AT walker which appears in the films The Empire Strikes Back (1980) and Return of the Jedi (1983). Similarly, a pair of protestors made an elaborate AT-AT costume with the words “IMPERIAL WALKER” emblazoned on the sides. In the Star Wars films, the AT-AT is a piece of hardware employed by the Empire in their quest to wipe out the rebels. By appropriating this image into their protest tactics, the activists in Wisconsin have drawn a parallel between their activities and the film, positioning themselves as righteous rebels battling against an evil empire that wishes to oppress them. This adds another level of meaning to the protest, which is informed by a knowledge of the films. 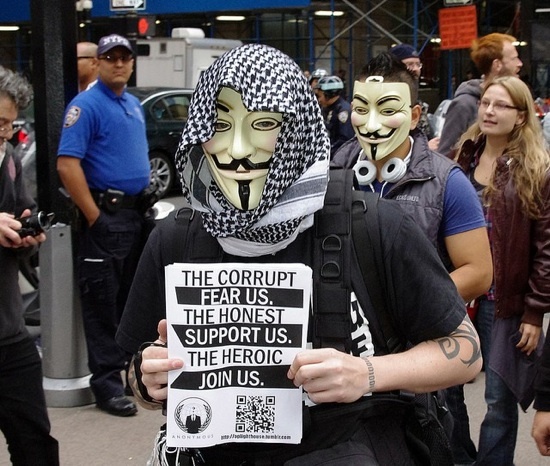 Similarly, both the online hacktivist group Anonymous and the Occupy Wall Street movement have appropriated the Guy Fawkes mask as a symbol of rebellion. The mask as designed originally appeared in Alan Moore and David Lloyd’s graphic novel V for Vendetta, but did not gain widespread popularity as a symbol of protest until it appeared in the 2005 film adaptation directed by James McTeigue. This presents an interesting case, since the actual Guy Fawkes was closely tied to protest tactics as a member of the Gunpowder Plot of 1605. This image was closely linked to rebellion and protest, to the point that people would burn an effigy of Fawkes during annual commemorations of the Gunpowder Plot. Moore and Lloyd appropriated Fawkes’s image into their graphic novel, and by doing so it became linked to a popular text and removed from its original context of protest and activism. This imagery was eventually re-appropriated by Anonymous, who first employed it as a meme on sites like 4chan, but then employed it in a protest of the Church of Scientology, thus linking it once more to protest tactics and schemas. For instance, it was linked to the protest of the London Stock Exchange when Wikileaks founder Julian Assange wore the mask when he addressed the crowd. 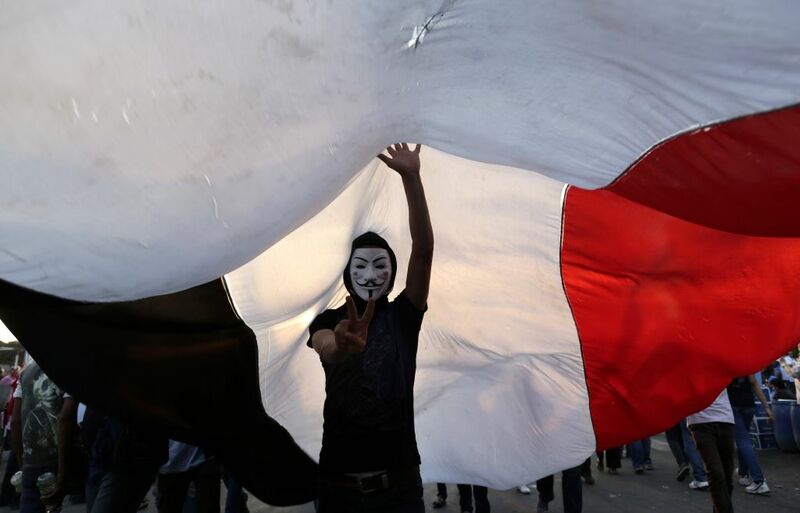 Similarly, students in India employed the mask as a symbol of rebellion when they wore it while protesting Internet censorship, in much the same way that the Wisconsin protestors appropriated this imagery during the protests of Governor Walker. 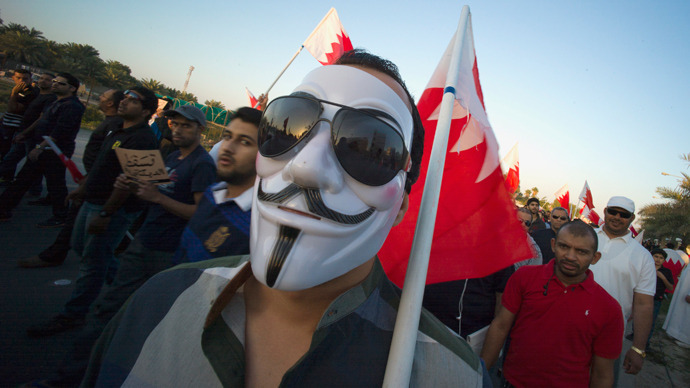 The mask has also become heavily identified with the Arab Spring demonstrations, and was a common sight at pro-democracy rallies throughout the Middle East. Thus, the meaning of the Guy Fawkes imagery changed once again because of how it was being used; it went from being simply a symbol of a pop culture text to a symbol of rebellion once more, reverting back to its original meaning in the process. This is a prime example of the way that protest tactics and fan iconography move back and forth across the boundaries of movement societies, and how they can inform one another, altering and reinforcing meaning in the process. Fig. 3: The image of Guy Fawkes popularized by Alan Moore and David Lloyd in their graphic novel V for Vendetta has become a symbol of protest worldwide, and has been appropriated by protestors from India (left) to Wisconsin (right). Some have used these revelations as an opportunity to accuse Anonymous of hypocrisy, such as Martha Gill (2013) of The Telegraph, who writes that Anonymous “stands and falls on its integrity – and if it can’t afford to play by it’s (sic) own rules, it certainly can’t afford to break them” (online). There is undoubtedly an irony in the fact that the “props that are supposed to be a symbol of the resistance are actually made in South American factories by workers who themselves are likely suffering under the negative impacts of the globalized capitalistic system that Anonymous often rails against” (Sheets, 2013, online). 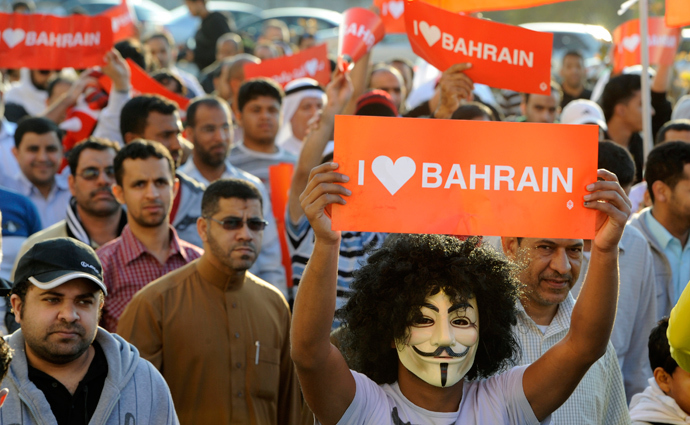 Nevertheless, this has not stopped Anonymous from using the Guy Fawkes masks during their protest activities. In fact, the group seemingly shrugged off the accusations, taking to their Twitter page to write “Hey look everyone, our masks were made in some factory in a developing nation. We are the only hypocrites.” This refusal to abandon the symbol despite some negative connotations implies that the Guy Fawkes mask has once more become indelibly linked to notions of protest, and thus it points to the back and forth diffusion of fan imagery and protest tactics. It is obvious that protest tactics and schemas have become normalized, and have been employed in a wide-range of political and non-political claims making. A quick look at websites like petitiononline.com and credoaction.com bear this out, illustrating that individuals are increasingly using protest tactics to engage in both political and non-political action. This diffusion of protest tactics has been aided by the rise of the Internet, which is not responsible for the normalization of activism, but has made engaging in protest and activism much easier by both automating the process and instructing people in how to utilize protest tactics and schemas. As a result, fans have appropriated protest tactics to not only address causes relating to their fandom, but also to use their fannish identities to call attention to real world issues. Similarly, activists are appropriating fan iconography to draw attention to their causes, and also to inform, alter, and/or reinforce the meanings of their activism. More importantly, however, this diffusion flows in both directions, with fan iconography and protest tactics altering and reinforcing the meanings of one another as they move across the boundaries of movement societies. All of this is related to the normalization of protest tactics and schemas, which is not degrading the meaning of activism, but rather is simply altering the meanings of it depending on how they are being employed. Earl, J., & Kimport, K. (2009). Movement societies and digital protest: Fan activism and other nonpolitical protest online. American Sociological Association, 27(3), 220-243. Sullivan, J. L. (2013). Mass media audiences: Effects, users, institutions, and power. Thousand Oaks, California: SAGE Publications.